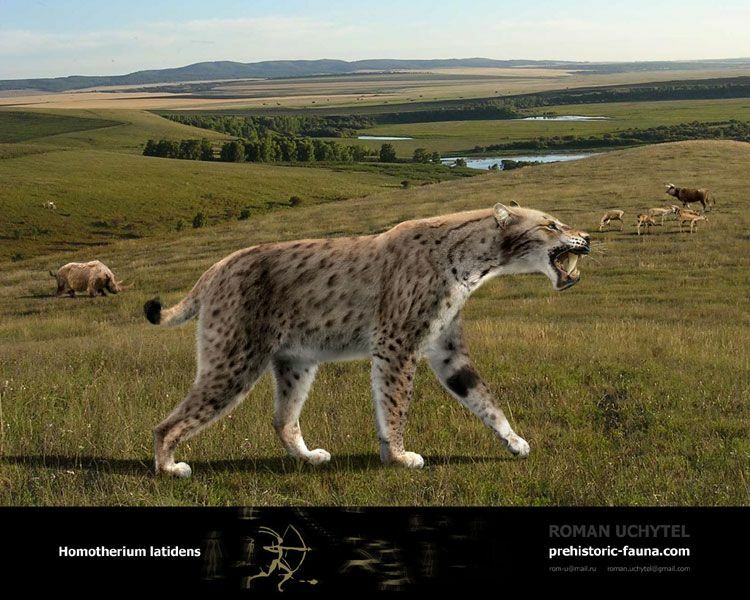 Homotherium is an extinct genus of machairodontine saber-toothed cats, often termed scimitar cats, endemic to North America, South America, Europe, Asia, and Africa during the Pliocene and Pleistocene epochs (5 mya–10 000 years ago), existing for approximately 5 million years. Homotherium reached 1.1 m at the shoulder and was therefore about the size of a lion, weighing an estimated 190 kg. Compared to some other machairodonts, like Smilodon or Megantereon, Homotherium had relatively shorter upper canines, but they were flat, serrated and longer than those of any living cat. Incisors and lower canines formed a powerful puncturing and gripping device. Among living cats, only the tiger (Panthera tigris) has such large incisors, which aid in lifting and carrying prey. The molars of Homotherium were rather weak and not adapted for bone crushing. The skull was longer than in Smilodon and had a well-developed crest, where muscles were attached to power the lower jaw. This jaw had down-turned forward flanges to protect the scimitars. Its large canine teeth were crenulated and designed for slashing rather than purely stabbing. It had the general appearance of a cat, but some of its physical characteristics are rather unusual for a large cat. The limb proportions of Homotherium gave it a hyena-like appearance. The forelegs were elongated, while the hind quarters were rather squat with feet perhaps partially plantigrade, causing the back to slope towards the short tail. Features of the hindlimbs indicate that this cat was moderately capable of leaping. The pelvic region, including the sacral vertebrae, were bear-like, as was the short tail composed of 13 vertebrae—about half the number in long-tailed cats. The lion should take this. Based on the images and the descriptions, the lion seems to be better equipped for combat. The lion seems to be more agile, explosive, and stronger. The hyena like physique which E. Scimitar has, seems to be a huge disadvantage in combat. Just like hyenas, E. Scimitar is not as agile or explosive. Not to mention that E. Scimatar's forelimbs look rather lean in comparison to the lion - I doubt it would even be able to throw a proper strike. So, in terms of paw strikes and grappling, the lion is going to do more damage. The only reason why this may be contestible match up is because of E. Scimatar's jaws. Based on the description, E. Scimatar seems to have more well developed molars and incissors than the lion. So, perhaps, E. Scimatar's jaws might be able to slash and cut through flesh better? But, honestly, I don't think that is enough to counter the lion's advantages. I don't think having better developed incisors can counter for the lion having stronger forequarters, larger canine teeth, being faster, more explosive, and more agile. H. latidens is roughly equal to or slightly less robust overall than an African lion, so it would be about equal to the comparatively gracile Asiatic lion. The sloped back is noted to have provided stability when dealing with prey, this being something that would be carried over to fighting competitors. It is still just as flexible as any given cat and would very easily still be able to grapple. It was possibly slower and less agile but it likely has more stamina than other cats, but not to the extent of a true hyena or canid, most likely. It would do just fine against either version of the lion. And before anyone mentions "oh lions r here and they aren't", keep in mind H. latidens was the size of a lion and competed directly with P. spelea, which itself was even larger than a modern lion and they still managed to survive, until genus Homo showed up. Remember, Leo.persica is only very lately regarded as 'gracile', & that is wholly due to baleful human interference. The cause doesn't matter. It is what it is, and it is more gracile than its African sibling. Not necessarily, since it aint extinct, & we could include 'Barbary lion' genes, too - if we wanted to 'grow our own'. If it was more robust in the past, then it was more robust in the past. Since it's a modern population, that's the only thing that matters. And how on earth do you plan to introduce Barbary lion genes into Asiatic lion genomes and grow them up soon enough to actually take place in this hypothetical matchup based off of a modern population versus an extinct animal? The common large felid from the late Pleistocene of Europe is the cave lion (Panthera leo spelaea), which is supposed to have preyed upon nearly all of the available larger mammals in its vicinity, such as horse, deer, bison, aurochs, yak, musk ox, sheep, goat, saiga antelope, juvenile mammoth, and juvenile rhinoceros (Kahlke, 1999). Homotherium was of almost the same size as the cave lion, and it is supposed to have fed upon juvenile Mammuthus primigenius and other such large prey (Hooijer, 1962; Turner and Anto´n, 1997). The recovery of only a single dentary in the North Sea is obviously not enough to make suppositions about the geographical range of Homotherium in Europe during the late Pleistocene. Further investigations will be needed to determine if specimens of H. latidens can be found in existing collections of late Pleistocene postcranial fossils now attributed to P. leo spelaea. In this respect, it is finally worth stressing that the now established occurrence of this large predator as an element of the late Pleistocene large carnivore guild opens a new perspective, and necessitates a re-evaluation of the competitive relationship between large carnivorans and Homo in the late Pleistocene of Europe. Evidence of cursorial adaptations in Homotherium suggests a hunting technique different from modern cats or smilodontine sabre-tooths. Some, like reduction of the claws, would have limited the ability of individual homotheres to bring down large prey, implying group action. Homotherium would also have been disadvantaged in direct confrontation with Pleistocene lions by smaller body mass, reduced forepaw muscle strength, smaller claws and more fragile dentition. Its hunting technique would have worked best in more open habitats, but competition from lions would have forced it to seek moderate cover. Homotherium had relatively shorter upper canines, but they were flat, serrated and longer than those of any living cat. Incisors and lower canines formed a powerful puncturing and gripping device. Among living cats, only the tiger has such large incisors, which aid in lifting and carrying prey. The molars of Homotherium were rather weak and not adapted for bone crushing. The skull was longer than in Smilodon and had a well-developed crest, where muscles were attached to power the lower jaw. This jaw had down-turned forward flanges to protect the scimitars. Its large canine teeth were crenulated and designed for slashing rather than purely stabbing. The only disadvantage i ve seen the limb proportions of Homotherium gave it a hyena-like appearance that may cause difficulty in fighting with Lion but IMO Homotheruim damage a lot more then lion due to his jaw however lion would probably defeat him in grappling but i cant say they can control similar size homotheruim. SK i agree lion has better grappling ability,but how do lion manage his grappling ability against the similar size homo with powerful jaws, can do more damage then lion? in that case i would go for 50/50 rather then give edge to lion. just suppose in this video if its scimitar vs lion, who will damage a lot? (04-15-2019, 04:53 PM)zergthe Wrote: H. latidens is roughly equal to or slightly less robust overall than an African lion, so it would be about equal to the comparatively gracile Asiatic lion. The sloped back is noted to have provided stability when dealing with prey, this being something that would be carried over to fighting competitors. It is still just as flexible as any given cat and would very easily still be able to grapple. It was possibly slower and less agile but it likely has more stamina than other cats, but not to the extent of a true hyena or canid, most likely. It would do just fine against either version of the lion. What makes you think that E. Scimitar would do more damage than P. Leo in grappling ability? Are you suggesting that E. Scimitar has a stronger bite than P. Leo? If that is the case, than do you have any data to support that claim? Thanks for sharing that video - it goes to show how well lions can grapple. Not to mention that lions seem to be the best jaw grapplers among all the big cats. In that video, if it was one lion and one E. Scimitar, the lion, undoubtly, would do more damage. H. Latidens's bones might be as robust (or maybe slighlty more) than the Asiatic lion's, however, in terms of overall physical strength and muscle mass, the lion certainly takes the cake. The sloped back might provide stability in combat, however, at the same time, it makes H. Latidens less explosive and it's movements would be slower. Have smaller hind legs to front legs means that you won't be as quick of your feet. Just looking at it's hyena like physique, I doubt H. Latidens is as flexible as a lion. It might be able to grapple, but certainly not as well as the lion. Agreed - however, keep in mind, that managing to survive with predators stronger than you, and actually fighting them, are two completely different beasts. reddhole Wrote: The scimiar cat or homotherius was a very interesting cat. It was far less robust than smilodon, but how it compares with extant big cats is the more important question. Most analyses conclude that homotherium was moderately cursorial and therefore less robust than extant big cats. Basically, homotherium had less robust forelimbs (including related muscles - shoulders, chest , etc.) and smaller claws than extant big cats. However, homotherium had a shorter and more robust lower back. In addition, homotherium had rear limbs that were better able to withstand stresses in a violent struggle (i.e. grappling prey or an opponent in a fight). Finally, homotherium had enlarged incisors (teeth between canines), which may have helped restrain prey and compensate for less forelimb grappling ability. However, these analyses compared the somewhat less robust european scimitar cat, homotherium latidens, instead of the american species, homotherium serum, with extant big cats. Note: the lion's value is on the high end of the range I've seen for lion. 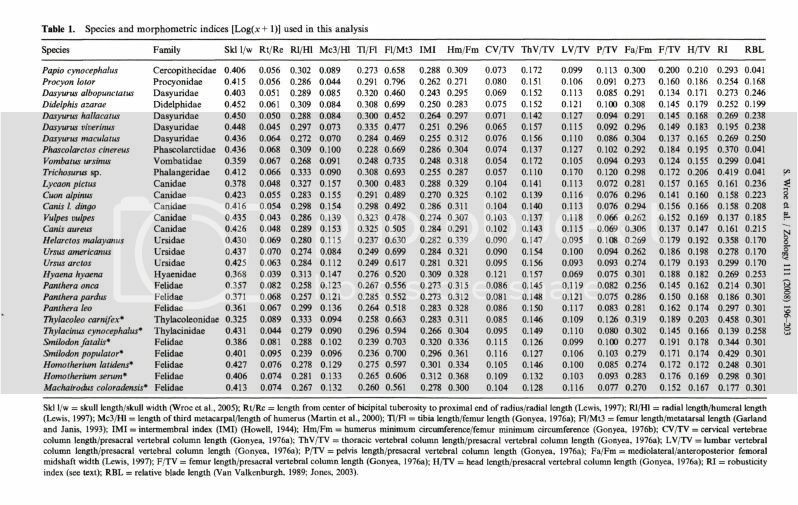 In the study posted in Ursus's post, lions had a lower radius/humerus ratio than Homotherium serum. Mc3/HI: Metacarpal length/humerus. Higher values equal more cursorial. Ti/FI: Tibia/femur - higher values equal more cursorial and less stability of the rear limbs all else being equal. FI/Mt3: femur length/metatarsal length - smaller values equal more cursorial. Lv/tv: this indicates the relative size of the lower back. A shorter back and smaller ratio equals a stronger and more stable lower back all else being equal. Robusticity Index: This measures how much weight is in the trunk of an animal and gives a broad indication of overall strength. 1) Its stronger lower back and rear limbs and enlarged incisors. All of which could potentially compensate for more slender forelimbs. 2) Stronger biceps and potentially pulling power. 1) Large black bears (i.e. 400 + lb. animals) tend to be relatively fat. At least that is the case here in the Northeastern US - a lot of the heavy bears are garbage feeders. 2) Black bears have weak bites and small canines for their size. 3) Scimitar cat can easily kill the bear if it can get the bear to the ground with its deadly bite. Taipan's post included certain salient points. Do also note that O-F 786's vid shows related male lions 'sparring', as a 'trial of strength' contest, & not a killing. businesslike lions really are when putting in a killing bite. in a much more formidable category in a 'fight' than a leopard, hyena, or even a lioness. male cousins/coalition mates, or even in 'beat downs' of other pride members, as a lion social dominance routine. its unlikely that H.latidens would be treated any differently, as Taipan pointed out. Amazing research. I am going to counter some of the things you said in your conclusion. 1. Agreed. But, when it comes to combat, having more powerful forelimbs is more important. Also, while the E. Scimitar may have picked up the advantage in hindlimb and back strength, it still lacks the agility and explosive power of the lion. And, having bigger incisors might allow it to slice through flesh more easily, but overall, the lion's jaws are better equipped for killing - lions have longer and sharper canine teeth designed to penetrate through flesh and bone. 2. I doubt it had stronger biceps. If we cast aside tigers for a second, lions have amazingly larger upper arms in comparison to most big cats. Also, the lion likely has more shoulder strength to, allowing more rotational movement and giving it the stronger paw strike. 3. Agreed - but as mentioned in point one, that won't do much for the E. Scimitar. I don't favor E. Scimitar over a black bear - but that is another debate. @SK i am telling their bite force are more then Lion i said their teeth are far larger then lion thats why i suppose that they can do more damage.